Diamondbacks pitcher Bronson Arroyo, right, wipes his face as he talks with catcher Miguel Montero during the fourth inning Tuesday against the Mets. Arroyo did not make it out of the fourth inning in Arizona's 9-0 loss. PHOENIX — A shoddy bullpen held back the Arizona Diamondbacks last season. So far this year, it’s the starting rotation that’s giving them fits. 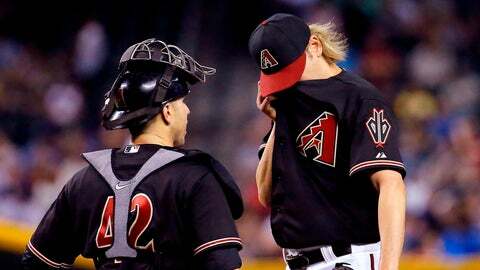 Bronson Arroyo allowed 10 runs in less than four innings and the Diamondbacks stretched their home losing streak to seven games with a disheartening 9-0 defeat to the New York Mets on Tuesday night. "Last year, it was the bullpen giving it up and this year it’s just the inverse," manager Kirk Gibson said. "That part is very frustrating." Struggling heading into the three-game series, the Mets have gotten hot in the desert. New York had 13 hits to win the opener and got 12 more Tuesday to ensure a winning record on its nine-game road trip. Kirk Nieuwenhuis had three hits, three RBIs and a made a diving catch in center field after being called up to replace Juan Lagares, who was placed on the 15-day disabled list with a pulled right groin. 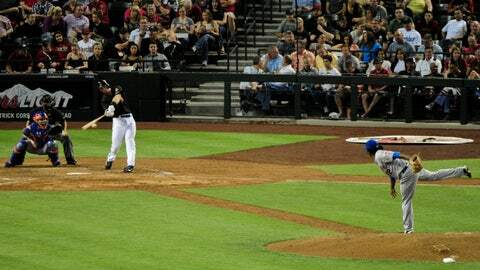 Nieuwenhuis hit a two-run homer to the pool deck at Chase Field in a six-run fourth off Arroyo (1-1), and Eric Young Jr. added three hits with two RBIs. New York also got solid pitching, something that’s been rare this season. Jenrry Mejia (2-0) tossed five effective innings before leaving with a torn blister, combining with Gonzalez Germen and Kyle Farnsworth on a three-hitter for a second straight decisive victory over Arizona. "It was a good win for us," Nieuwenhuis said. "Hopefully we can keep it going." The Diamondbacks had another awful night on the mound, losing for the eighth time in nine games at Chase Field. Arroyo had one of the worst outings of his career and Arizona has given up 38 runs — most of those by the starters — through the first five games of a homestand that ends Wednesday against the Mets. At 4-14, the Diamondbacks have matched the worst start in team history (1998). "It’s contagious and it’s frustrating for all the pitchers as well," catcher Miguel Montero said. "I’m hoping one of these guys have a quality start and get on a roll. It can be contagious the other way: they get their confidence back, hopefully sooner than later." Mejia struggled with walks during his first two starts — nine in 11 innings — but was hitting his spots against the Diamondbacks. He was perfect through three innings and didn’t allow a hit until Paul Goldschmidt sneaked a single inside third base with one out in the fourth. Mejia escaped a jam in the fifth inning and got some defensive help from Nieuwenhuis, who made a sliding catch in center to rob Mark Trumbo of a hit. The right-hander tore a blister on his right index finger and didn’t come out for the sixth after allowing two hits. "Until the blister started to act up, he threw the ball very well," Mets manager Terry Collins said. "About the fifth inning, we knew the finger was getting hot and were hoping to get another 20 pitches out of him, but didn’t get that." Arroyo got an extra day of rest between starts, but it didn’t seem to do him much good. New York jumped on him from the start, stringing together three straight singles and scoring three runs in the first inning. Nieuwenhuis capped the outburst with a run-scoring single up the middle. It got much worse for Arroyo in the fourth. Nieuwenhuis added his pool-deck homer to right-center and Young followed with a two-run single to left. New York scored another run on a single and error by center fielder A.J. Pollock and went up 9-0 on Andrew Brown’s fielder’s choice. Arroyo allowed 10 runs and nine hits in 3 1-3 innings. "It was 3-0 after the first inning and that’s exactly what we couldn’t have on this ballclub right now," Arroyo said. "It just kills the morale of a team when you’re losing constantly and giving up runs a lot, then you give up a three-spot early on. It just grew from there." About the only thing that went right for the Diamondbacks came in the fifth inning when Gibson challenged a close play at first and had it overturned on replay — with the score 9-0. Mejia got two weak groundouts with two on to end the inning.